This offer is valid today only, December 8, 2014, or while supplies last. Because we’re super nice, we’ll break it down for you. So on the model with 64GB of storage, you actually save MORE than 50%. You save 53%. Grab it while you can. Or, in the immortal words of Badfinger, if you want it, here it is, come and get it. Technically it’s go and get it. Or click on the link and purchase it. Whatever. 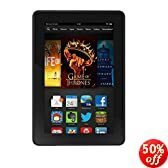 It’s a hell of a deal on a Kindle Fire, so if you were planning on getting one anyway, might as well get it now and pay less money. Both are good options. I can’t say I’ve used either one hands on, but the price is right especially if you are an Amazon Prime member. 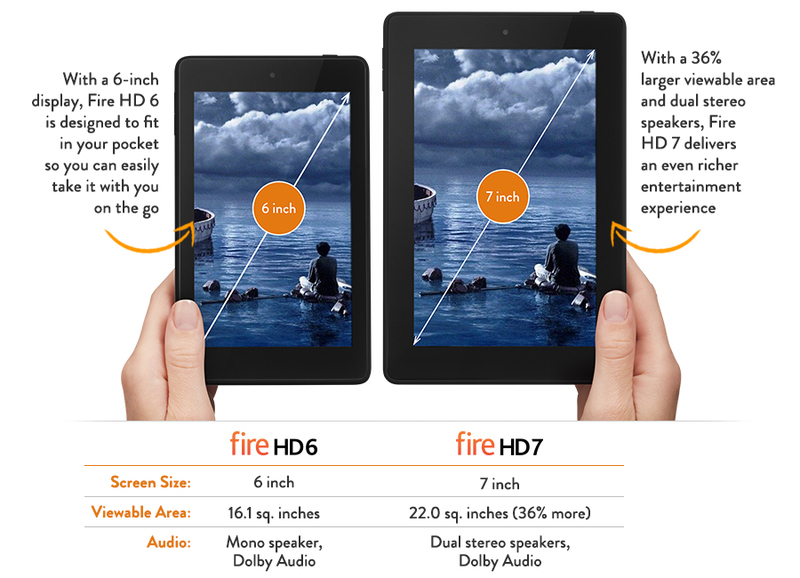 Fire HD 6 – Amazon. Ideally, if you can afford it, you’d like to get your kid(s) a tablet of their own. 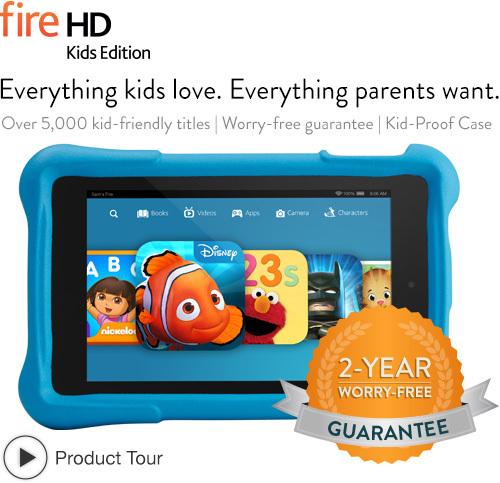 Amazon hopes that you will buy their new kid-friendly Kindle Fire. – A “Kid-Proof Case” is included. Basically it’s a protective bumper-style case that you can buy for existing tablets, but with the Fire HD Kids Edition, you don’t have to buy it separately and you can pick between three different colors — blue, green, or pink. More important is this next bit. – 2-Year Worry-Free Guarantee. Here is the wording from Amazon.com: “Enjoy the peace of mind with an unprecedented 2-year worry-free guarantee—if they break it, we’ll replace it for free. No questions asked.” That’s huge. Really. Kids break stuff. It happens. Usually you have to pay a bundle for an extended warranty, and if the thing actually does break you have to crawl through broken glass to get them to repair/replace it. A 2-year, no questions asked replacement policy is a sweet thing. – One Year of Amazon FreeTime Unlimited. Described by Amazon as, “a hand-curated subscription of over 5,000 kid-friendly books, movies, TV shows, educational apps, and games,” this is presumably the razor blade to the Fire razor. Get a year for free, get the kid hooked, then start making your annual tithe to Amazon after the free year is up. There’s no obligation to do so, though. Sometimes parents forget that they can say no. So you can use the tablet yourself when the kids are done with it. That’s handy. Also, as much as I prefer the idea of actually saying “you have to read a book before you can play video games”, the idea of assigning that task to a machine is… well, it’s future-thinking, it’s where we’re headed as a society (at least those who can afford it) and I like the feature. It’s not clear to me if you would still be able to use the Parental Controls/Kindle FreeTime without a subscription. Bottom line: not a bad price for what looks like a pretty powerful and useful tablet. Available for pre-order now. Read more about it at Amazon.com, and also check out the articles below (which come from other sites and we take no responsibility for their content). Amazon is once again offering a limited-time price break on their Kindle Fire Tablet line. Here’s the sale price breakdown: Kindle Fire HD for $124 (down from $139), Kindle Fire HDX for $199 (down from $229), Kindle Fire HDX 8.9″ for $339 (down from $379), and Kindle Fire HD 8.9″ for $189 (down from $269). Such a deal! These prices are only good through tomorrow, February 14, 2014. Note: those prices are for the Kindle Fire With Special Offers, aka ads. If you want it without special offers, you have to pay a little bit more. What’s the difference between the Kindle Fire HD and the Kindle Fire HDX? Resolution. Not the kind you make on New Year’s, the kind that makes for more pixels on a tablet screen. For example, the Kindle Fire HD has a 7-inch screen with a resolution of 216 ppi, or 1280×800. The Kindle Fire HDX has a 7-inch screen with a resolution of 323 ppi, or 1920×1200. The HDX model also has “The fastest processor on a 7-inch tablet”, according to Amazon — “2.2GHz quad-core processor and 2GB of RAM for fast, fluid multi-tasking, gaming, and video.” That’s FOUR CORES, people. FOUR. More cores equals better performance when you’re consuming content on your Kindle Fire. Bottom line: as we say every time Amazon throws consumers a bone and lowers the prices on Kindles for a limited-time sale, if you’ve been thinking about buying a Kindle Fire, now is a good time because you’ll pay less money. Sale ends February 14, 2014. Happy Valentine’s Day!